There is an image that is woven into Kiya Winston Tomlin’s ’96 mind like a well-made garment. It’s crisp and unforgettable. The image helped shape an 8-year-old girl’s view of fashion, and how it can leave an impression years after the person wearing it has left the room. It was the summer of 1982 in East Stroudsburg, Pennsylvania, and Kiya was away from home at a gymnastics camp. She had befriended one of Ross’s daughters at the summer program and Ross had come for a visit that day, says Kiya, who didn’t know before the meeting that her new friend’s mother was Diana Ross. “The entire scene still replays like a slow motion dream to me ... the vision of elegance, drape of the fabric and the ease of her sitting with us defines my brand concept to this day,” Kiya says. Kiya wants women to feel comfortable, confident and beautiful when they wear her designs, the same way she viewed Ross that summer day as a little girl. Launched in 2014, the Kiya Tomlin fashion brand offers practical, versatile and stylish clothing. The durable, yet soft fabric of the garments drapes the body just enough to give the wearer an attractive silhouette without restricting her from carrying out life’s everyday tasks of working, going out to dinner with friends, taking the children to soccer practice or picking up a gallon of milk at the grocery store. Kiya, the wife of Pittsburgh Steelers Head Coach Mike Tomlin ’95, L.H.D. ’08, and the mother of three, lives a similar life and wanted to make clothing for women to navigate their day with ease, comfort and class. 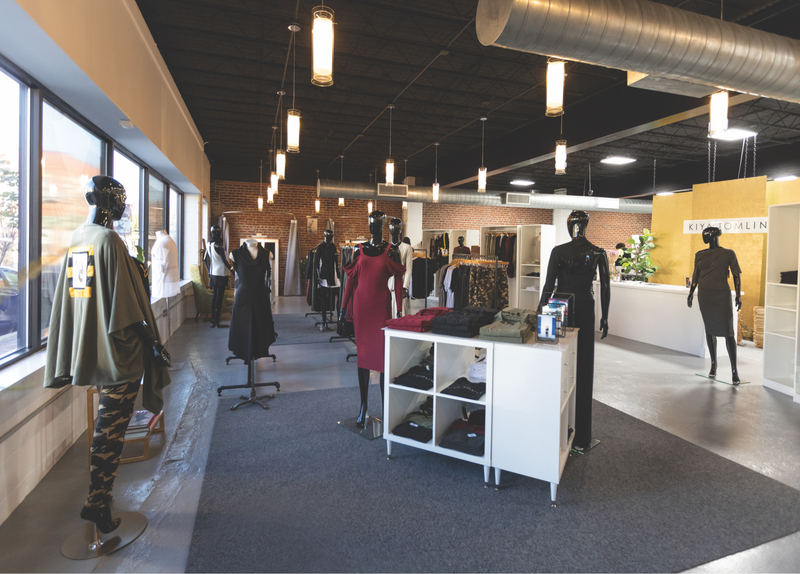 In August of 2018, Kiya expanded her business by selling and manufacturing the brand’s clothing under one roof, opening the Kiya Tomlin Work/Shop in Etna, eight miles north of downtown Pittsburgh. The expansion gives customers a rare glimpse into how clothing transforms from rolls of fabric in a factory to an outfit for work or play. 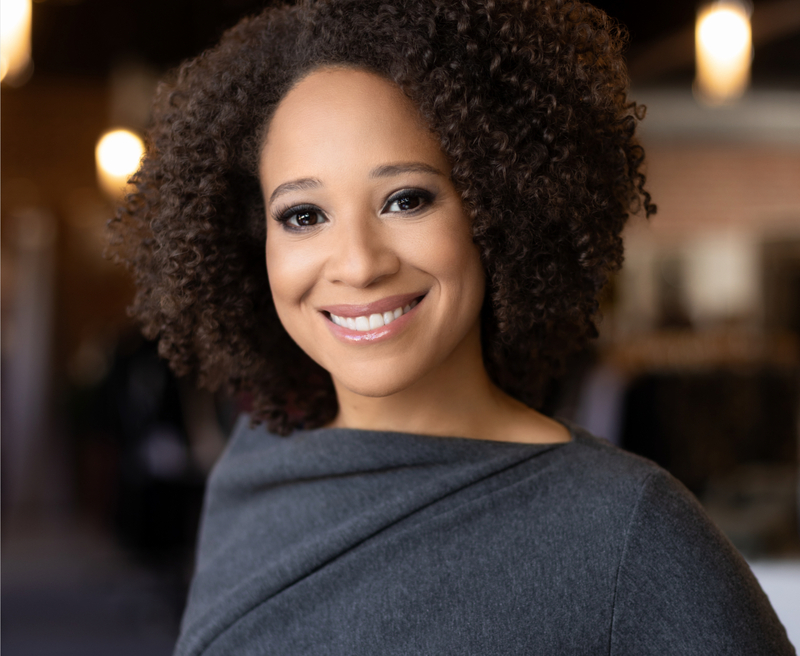 Kiya, who grew up in northern New Jersey, began designing and making clothing at 10 years old for a practical reason; she struggled to find clothes for her petite frame. “I wanted to wear clothing that I would see fashionable people wear, but that type of clothing wasn’t available in children’s sizes, so I asked Santa for a sewing machine for Christmas,” Kiya says. The new sewing machine quickly became a regular fixture on the family’s kitchen table, says Susan Winston, Kiya’s mother. Winston dusted off her eighth-grade home economics skills, read the sewing machine’s manual and the two learned how to operate it together. First they made a stuffed duck in order to learn the basics. Then Kiya made her first garment: a chambray jumpsuit with tapered legs. By the time Kiya reached middle school she was making her entire wardrobe, shifting back-to-school shopping from the mall to the neighborhood fabric store. Despite her natural skill and interest in making clothing, Kiya didn’t envision herself pursuing a career as a fashion designer. She wanted to study medicine. Her mother tried to steer her toward fashion after high school, but Kiya wanted to be a doctor. Kiya and her two siblings knew that to attend college outside of New Jersey they needed scholarships. Her first trip to William & Mary was during a college tour the November of her senior year in high school. Kiya, a psychology major, balanced books with gymnastics, where she held the record in the uneven bars category for several years. Kiya used her spare time to make custom clothing for fellow students, including her roommate of four years, Romanda Williams ’96. The two met their freshman year when they stayed in DuPont Hall 3C. The two have remained friends and try to visit one another at least once a year. Williams still wears Kiya’s designs. The Kiya Tomlin Work/Shop is a modern storefront in a quite rustic strip of downtown Etna. The mom-and-pop shops that are open nearby have preserved the small-town charm of this borough. Kiya wanted to move into an area with little commercial influence with hopes of spurring economic growth. Prior to opening the Work/Shop, Kiya had a storefront in the East Liberty section of Pittsburgh and a separate manufacturing location. She says having both retail and manufacturing in one place has improved efficiency. Hand Crafted: The Kiya Tomlin brand was born out of her own need to have clothing that could be worn anywhere — dressed up or dressed down. She needed clothing that fit her busy life as a wife and working mother of three children. She soon learned other women wanted comfortable and versatile clothing as well. The Work/Shop is an open contemporary space with exposed brick and drop light fixtures. There are also subtle art elements in the design of the Work/Shop that make it aesthetically unique. Professional photographs of models wearing Kiya’s designs hang on the wall by the same hangers that display her clothing in real life. The manufacturing area is adjacent to the retail space and gives shoppers a front-row seat to how designs are created. The words “I made your clothes” are written on a back wall. It is a space comprised of rolls of fabric, sewing machines, a wall of thread and design patterns. Everything is done from scratch in the Work/Shop. Kiya and her staff draft designs by hand before cutting them out of cardboard to make a template. They spend hours sewing the fabric into wearable clothing to ship to boutiques across the country, fill online orders or build up inventory. Kiya and Mike met in the training room at William & Mary while they were both injured. Kiya had a gymnastics injury and Mike was hurt from football. They were engaged the Christmas of her senior year and married two weeks after graduation. The couple relocated to Memphis in the spring of 1996 because Mike was working as a graduate assistant at the University of Memphis. While in their new city, Kiya had been preparing to take the MCAT, but changed her mind the day of the exam. The long hours, travel and unpredictability that came with college coaching made Kiya second-guess pursuing a career as a doctor. The first few years of the couple’s marriage were spent moving to various cities as Mike pursued coaching positions in Tennessee, Arkansas and Ohio. Kiya continued to custom design and had customers in each city through word-of-mouth. Once settled in Cincinnati, Kiya enrolled in the University of Cincinnati’s fashion design program. Though she had designed for several years at that point, she wanted to learn new skills. Kiya learned the foundations of design, which included pattern drafting and draping, two techniques designers use to create clothing without using commercial patterns. After two years in Cincinnati the couple relocated to Florida when Mike was offered a coaching position with the Tampa Bay Buccaneers. The move to Tampa meant that school was over for Kiya and she needed to decide her next move. She launched a custom design business, specifically catered to creating wedding gowns. During the five years in Tampa the couple had two sons, with Kiya continuing to design around taking care of the children. Though she continued making wedding dresses, she wasn’t using the formal fashion designing training she had received in Cincinnati. In 2007 the family relocated to Pittsburgh when Mike became the head coach of the Steelers. By this time the family had grown to five with the birth of their daughter. In a place like Pittsburgh where Steelers football and history define its identity, fashion is not a main attribute of the city’s DNA. There are hints of it here and there, but they are subtle at best. Kiya designed the Game Day Collection with the Pittsburgh demographic in mind. The collection features Steelers football team patches sewn onto select garments. The first design idea for the Kiya Tomlin fashion brand came years before she officially launched her business. It stemmed from the absence of Mike’s clothing in the couple’s laundry bin early in their marriage. Kiya was preparing to wash clothes and noticed the only garments in the basket were her own. “I was wondering where are all his clothes?” Kiya says. Kiya observed Mike’s routine, which included leaving their home before sunrise and returning around midnight. Every day he would wear sweats — the same sweats. Still puzzled, she decided to ask him about his dirty clothes and was surprised by his answer. A RELAXED FIT: Kiya Tomlin’s designs accommodate the everyday woman who wants her clothing to provide both style and comfort. The Signature Dress wasn’t intended to be the start of the Kiya Tomlin clothing brand, but it was. Made of bamboo, cotton and spandex sweatshirt fleece, the Signature Dress is sleeveless and has a classic cowl neckline, deep front pockets and a reverse high-low hemline. To Kiya, it was a comfortable dress to wear in her busy life. Unbeknownst to her, she would become a model for her own brand. Though her custom business continued to grow as she raised her children full time, Kiya decided to wait until her daughter entered kindergarten before fully launching the brand. Kiya’s designs are loose fitting and soft to the touch but durable. Her designs are simplistic without sacrificing style. The clothing is comparable to the comfort of a sweatshirt, but does not feel like a traditional one. The bamboo fabric softens the garment, allowing it to retain the same level of comfort after repeated machine washes, Kiya says. While the brand’s target customers are women between 30 and 60, customers who fall outside that range often buy her clothing. “Within one day I had a college freshman and an 80-year-old woman on a walker who each bought something,” Kiya says. The most popular garment is the French Terry Peep Shoulder Tee, which has an elbow-length sleeve and exposed right shoulder. It retails for $138. The average garment sells for around $150. The Beautiful T-shirt is also very popular and sells for much lower, at $48. But the accolades do not influence the next design for Kiya. The customers do. 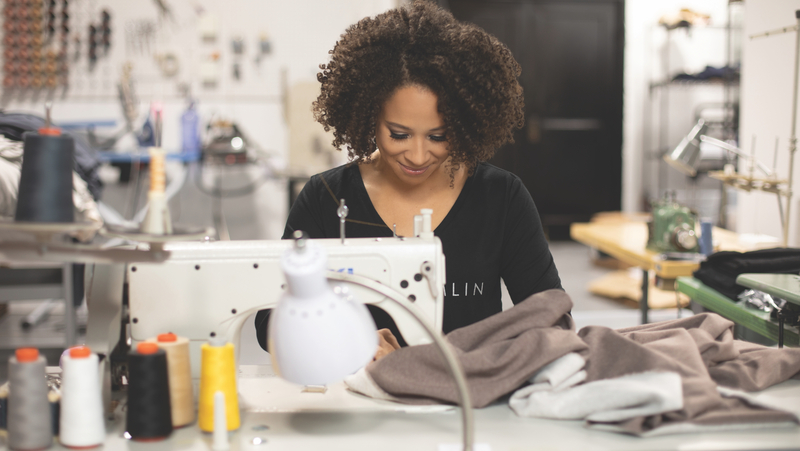 Just as she sought out a sewing machine to create custom clothing to fit her better at the age of 10, she strives to deliver a personalized fit to women who buy the Kiya Tomlin brand. To see Kiya’s designs, visit www.kiyatomlin.us.